Which Direction Should I Travel on the North Coast 500? Clockwise or anticlockwise… that is the question! Since the route is set up in a circular manner, you can go one of two ways. While many people choose to drive west from Inverness and complete the route in a clockwise direction, we decided to head north and travel counter-clockwise. There are benefits to both. Traveling clockwise, the coast will be directly to your left, whereas traveling counter-clockwise (or anticlockwise), you’ll have a lane of passing cars on your right between you and the coast. Despite this, we chose to travel counter-clockwise for two main reasons: 1) We didn’t want to encounter the Bealach na Ba pass near Applecross on our first day, as we were driving a semi-large campervan and felt that we needed to get used to the vehicle before tackling this challenging portion of the drive (more on that later), and 2) We wanted to add in a visit to Isle of Skye toward the tail-end of our journey. So, as to not backtrack, we started our journey north from Inverness! 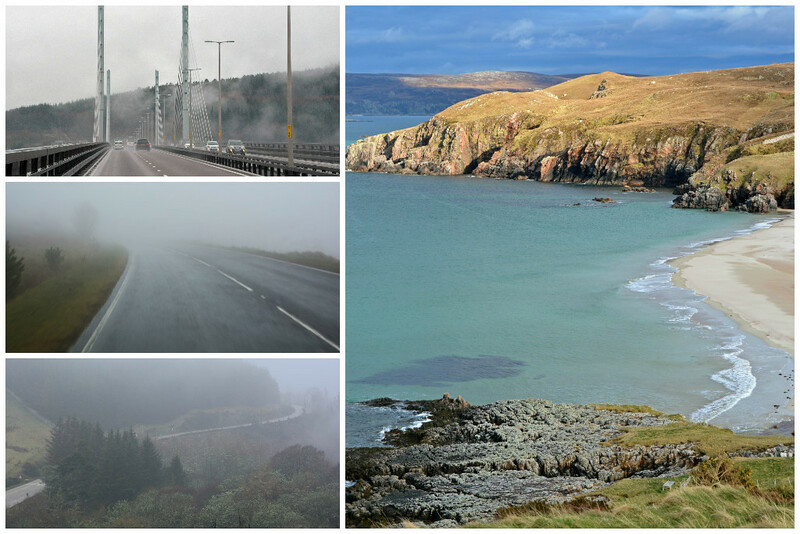 What is the North Coast 500 Weather Like Throughout the Year? Well, it is Scotland, and like with much of the UK, the weather can be unpredictable. We drove the North Coast 500 in the first week of April and as was expected, it was cold. And sadly, it rained… A LOT! For the first few days we were covered in a perpetual foggy mist that on occasion would turn into a blinding downpour. There were a few times where we had to pull over and just wait, because we didn’t want to miss seeing anything along the route. The sun didn’t make an appearance until about 3 days into our journey. We weren’t exactly equipped with the appropriate weatherproof clothing and footwear, so this kept our hiking to a minimum as many of the trails were extremely muddy. That being said, the weather was absolutely glorious for days toward the tail-end of our road trip, so we know for a fact that the sun does shine in Scotland! So basically, be ready for anything! Our new slogan for Scotland is All Seasons, All the Time, as we experienced a little bit of everything on our early April journey! In general, May and June are typically the sunniest months in North Scotland, whereas July and August are the warmest months with daily average temperatures of 66 °F (19 °C) at lower levels. January and February are the coldest months with daily averages only reaching about 36 °F (2 °C). TIP: Be Prepared! The weather can change in an instant. Bring layers to put on and take off, as necessary. Weatherproof clothing and footwear are always a good idea in this region. What Animals Will I See Along the North Coast 500? What would a trip to the highlands be without spotting some adorably fuzzy highland cows or indigenous red squirrels? You will hopefully spot these and several other animals along your journey, both on land and in the sea! Visit Chanonry Point in Rosemarkie at high tide for your best shot at spotting wild bottlenose dolphins from the shore. Keep your eyes peeled in the firths (small inlets) for seals, otters, and other marine life. Catch a glimpse of red deer grazing around Knocken Crag Nature Preserve. And don’t you worry, there’s a good chance you will see more than enough grazing sheep. A perk of traveling to Scotland in the springtime is the abundance of adorable baby animals! Baby lambs, highland cows, and mountain goats was about all the cuteness we could handle! This is where it all begins… and ends! Explore the small, yet bustling town of Inverness at the start or completion of your North Coast 500 itinerary. Because it was raining during our initial arrival into Inverness, we decided we’d check out the city on our way back through. So glad we did, as the weather was fantastic at the end of trip, though we only really had time to do a quick drive-through tour of the city. If you find yourself with time to spare in Inverness, stroll along the River Ness, visit the castle, stop by the Tomatin Distillery, and check out the Highlanders’ Museum. Once you leave Inverness, stop by the Black Isle Brewery, Scotland’s only organic brewery, to take a tour and sample some of their barrel-aged oatmeal stout or pollinated heather honey beer, among other delicious brews. And since you’re now on the Black Isle, head on up to Chanonry Point in Rosemarkie to see if you can spot those bottlenose dolphins! If you feel up for a drive to the end of the peninsula, you can check out Hugh Miller’s Birthplace Cottage & Museum. Other attractions once you leave the Black Isle peninsula include: the Dalmore Distillery, Tain through Time, and the Glenmorangie Distillery. For a look at even more distilleries along the route, check out this NC500 Itinerary. Although the town of Dornoch wasn’t too far from our starting point in Inverness, we didn’t want to pack too much into our first day, so we pulled into the Dornoch Campsite and called it a day! Give yourself time to explore this 13th-century charming small town and its expansive beach before moving on. Don’t miss its impressive cathedral. If you’re into golf, tee off on the Royal Dornoch championship course, ranked 13th in the world! TIP: Remember! The dolphins only really come out to play at Chanonry Point in Rosemarkie during high tide. Unfortunately for us, high tide was very early in the morning and very late at night, after the sun went down. Sadly, we didn’t see any dolphins during our visit, as it is low tide most of the day. Shortly after departing Dornoch, you’ll come upon Dunrobin Castle in Golspie (open April 1st-October 15th). The castle resembles a French château and is one of Britain’s oldest continuously inhabited houses, dating back to the early 1300s. Once you’ve had your fill of fancy curtains, pass Càrn Liath (an Iron Age broch), and make your way to the Clynelish Distillery. We thoroughly enjoyed our hour-long tour of the factory and warehouse followed by a sample of their award-winning whiskey. There are a few heritage centers along the way from Clynelish to the bustling town of Wick, though we stopped off at the historic Grey Cairns of Campster. The site was about 5 miles off the main road, but we found the history and purpose of these structures quite fascinating. Though we tried to see the Sinclair & Girnigoe Castle ruins just north of Wick, we were unsuccessful. We knew it didn’t open for the season until May, but we were hoping to see it from the outside. No such luck, as it is situated on a cliffside inaccessible during our time of visit, unless we wanted to slosh through a muddy field. Our final stop of the day was John O’ Groats, Scotland’s most northeasterly point and home to the Duncansby Stacks. TIP: Know the way! Although there is a well trodden path along the fence leading away from the lighthouse at Duncansby Head, go up and over the hill near the lamppost behind the ‘Coaches Only’ parking in the parking lot for a more direct route to the Duncansby Stacks. Now that you’ve visited Scotland’s most northeastly point, head a few miles west to Dunnet Head and stand at the most northerly point on mainland Britain. Marvel at the cliffs near the lighthouse and take in 360-degree views at the hilltop lookout point. For incredible views of Dunnet Bay Beach, drive pass the beach into Castletown. There’s a carpark just before an eerily abandoned house on the right. Continue west on the A836. Before the small town of Reay, you’ll drive through the most industrial part of the route, as you pass wind turbines, power lines, and factories. Before reaching Strathy, turn right at the sign pointing toward Portskerra. You’ll drive through a residential area, take a right at the fork, then turn right at the sign for Portskera Harbour. We hadn’t read about this location previously, but definitely wanted to mention it, as it was quite a find! We made our lunch and enjoyed the views overlooking Melvich Beach and the seaside cliffs. We then made the drive out to Strathy Point, and while the views along the way were great, the car park is more than a mile out from the lighthouse. The rest of the day, although overcast, was chock full of insanely beautiful scenery, including overlooks at Bettyhill, Borgie Glen, Torrisdale Bay, and Coldbackie. Skerray Harbor proved to be an interesting find as we came upon an abandoned artists’ haven in ruins of an old house. Kyle of Tongue was an impressive inlet including the ruins of Castle Varrich poised high on a hillside. 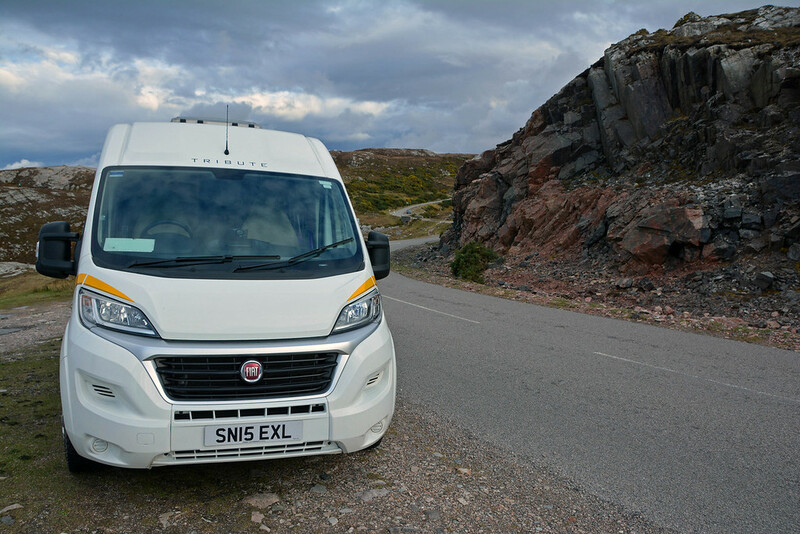 After enjoying quintessential Scottish highlands scenery (including a beautiful rainbow) around Loch Eriboll, we arrived at Smoo Cave. Though tours through the cave are available April through September, we arrived too late in the day to take advantage of this, so we briefly explored this magnificent cave on our own (the cave is only partially accessible without a tour). There are some great beaches in this area, including Balnakeil Beach. To get to Balnakeil, you must drive off the main road for about 2 miles. Supposedly this is where the famous Cocoa Mountain chocolate shop is, though we couldn’t find it on our GPS. You’ll also find a gorgeous beach just behind the Durness Visitor’s Center, so if you have questions about the surrounding area or just want to admire yet another beautiful beach, stop on by! The drive leading away from Durness was breathtaking. And though we didn’t go much further on this day, the views of the valley were a great way to wrap up another day on the North Coast 500! We parked our campervan at Scourie Campsite for the night. The views of Scourie Bay at sunset from their cliffside pitches can’t be beat! TIP: There’s more! During this portion of the drive you can also check out the Castle of Mey, the Castlehill Heritage Center, and the Strathvanver Museum if you need a history fix or somewhere to go if it’s raining! Though the roads became a little more harrowing during yesterday’s drive, nothing could compare to the narrow one-way lanes we were greeted with on the way to Drumbeg. Everyone mentions that the Bealach na Ba pass near Applecross is the scariest portion of the North Coast 500, but following our drive to Drumbeg, we were puzzled as to how this portion of the drive was never mentioned. Well, we survived and lived to tell about it, but just be prepared for narrow roads, blind summits, and tight turns. There is a bypass road if you don’t want to drive this portion, but we’d be lying if we said you wouldn’t miss much. Since it’s a peninsula, there are plenty of gorgeous beaches to admire, including Clashnessie, Clachtoll, and Achmelvich (which is a little off the route on yet another narrow road, but totally worth a visit). At the completion of this peninsula drive, you’ll be rewarded with the intriguing ruins of Ardvreck Castle along the banks of Loch Assynt. Driving through Knocken Crag National Nature Reserve, we saw countless red deer grazing and were able to snap some awesome shots of these majestic creatures. We didn’t get at far as we had hoped this day, as the rain really started to come down again as we were passing through the reserve. Rather than continuing down to Gairloch like we had planned, we stopped in the tiny town of Ardmair and set up camp at the Ardmair Campsite. Even though the weather was poor, the views from this site were still amazing. Highly recommended, though a little on the pricey side! I guess you’re paying for the views. TIP: Know Your Roadside Manners! On one-way roads, pay attention to the signs reading ‘Passing Place’. When you encounter another car on the road, pull off to the side at the nearest Passing Place (note, it may be behind you) and flash your headlights to let the other person know it is safe to pass. Typically, if someone flashes their lights at you, it means they are safely off the road and are telling you to proceed. Once you’ve passed through Ullapool, keep your eyes peeled for Lael Forest Gardens. This is an excellent (and free) place to walk along brief and peaceful forest paths. Feeling like you need to connect with nature further? Head to Corrieshalloch Gorge near Braemore. You may experience a little bit of vertigo while on the gently swaying suspension bridge overlooking water cascading 150ft (46m) over the Falls of Measach, and though a little bit terrifying, it’s definitely worth a stop! Just a half-mile past the gorge is a lovely lookout spot where we recommend you take a few moments to simply enjoy the view! Continue on the route toward Dundonnell to be rewarded with amazing vistas and seemingly endless horizons. Waterfalls pour down to rivers below cutting through the picturesque landscape. After passing along Little Loch Broom you’ll come to the absolutely stunning Gruinard Bay. This epic scene called for a lunch break, so we parked our campervan and chowed down with a view! Mellon Udrigle is another beach a little off the path, but definitely worth a visit. Inverewe Gardens near Poolewe is a botanical garden with an eclectic collection of vibrant florals and plants from all over the world. Our visit was a little early in the season, and while there wasn’t too much in bloom at the time, the grounds were a peaceful oasis to explore. Gairloch Beach and Big Sand Beach, both near to the gardens, are said to be spectacular spots to watch the sunset. Gairloch also has a Heritage Museum that may be worth checking out, as its displays and artifacts take you on a journey through time in the northwest Highlands. Departing from Gairloch, as you drive south toward Talladale, you’ll pass by the Loch Maree Islands and also have a wonderful view of the magnificent Ben Eighe as you make your way through the Ben Eighe National Nature Reserve. 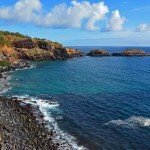 There are definitely some challenging hikes in this area if you’re looking to get your blood pumping! For further exhilaration, get ready, because you’re now coming upon the most talked-about portion of this grand adventure – Bealach na Ba (Pass of the Cattle) by Applecross. Passing through Torridon and along Upper Loch Torridon, as you climb and descend on narrow one-lane roads, you will want to stop often to catch your breath and to take lots of pictures! The west coast of the peninsula drive offers panoramic shots of the Isles of Rassay and Skye. Like with the drive to Drumbeg, there is an alternative route to which you can by-pass this white-knuckle drive. But, if you’re ready for some added adventure, conquer what is to known to many as one of the best drives in the UK! Prepare yourself to conquer super tight hairpin turns and switchbacks along the steep hillside with gradients reaching 20%. Too bad there’s not a distillery at the end… we both could’ve used a shot of whiskey after that! This was a rather long day, but who knew it would only get better from here?! For this was the night we tried wild camping in our campervan for the first time, and boy, did our sense of adventure pay off! We’re big night sky enthusiasts, so we picked a place to park away from city lights on an overlook at the edge of Loch Carron (in Stromeferry). After a late dinner, we decided to take a step outside to photograph the stars, as there were billions visible. Within minutes, the Northern Lights appeared and danced across the dark sky! Their alluring display only lasted a few minutes before the clouds rolled in, but it was enough to capture some great shots and make it a very memorable first night of wild camping. Curious about getting off the grid? Check out our post on Wild Camping in Scotland. TIP: Look Up! Scotland is an excellent place to view the Northern Lights (in the autumn and winter months). There are several locations around the country where you may have a chance at viewing this spectacular natural phenomenon including: Shetland, Orkney, and Caithness, Aberdeenshire and the Moray Coast, the Isles of Lewis, Harris, and Skye, Cairngorms National Park, Galloway Forest Park (Scotland’s only Dark Sky Park), Rannoch Moor and Perthshire, and Angus and the coast of Fife. And even if it isn’t the season for the Northern Lights, these locations should be perfect for star gazing, provided you have clear skies! This was our second visit to Scotland. We regretted not having visited Scotland’s most talked about island on our first visit, so we vowed to go on a return trip. Though the North Coast 500 route doesn’t include the Isle of Skye, we added a few extra days to our itinerary so we could explore what was recently named as one of the UK’s most beautiful islands in TripAdvisor’s Travellers’ Choice Awards. Because this post is all about the North Coast 500, you’ll have to head over to our Isle of Skye post to read more about our two days on this magical island! So for now, we’ll share a a few pictures with you to whet your appetite. Following our 2-day detour to the Isle of Skye, we were committed to completing the North Coast 500 route on our way to Cairngorms National Park. Passing through Glen Carron was a scenic treat as we made our way to the stunning Rogie Falls. The sun was shining as we drove back through Inverness to close out the incredible North Coast 500 route! So, maybe you were already planning a trip along the North Coast 500 or maybe just by reading this post, we’ve inspired you to pack your bags and head off to northwestern Scotland! 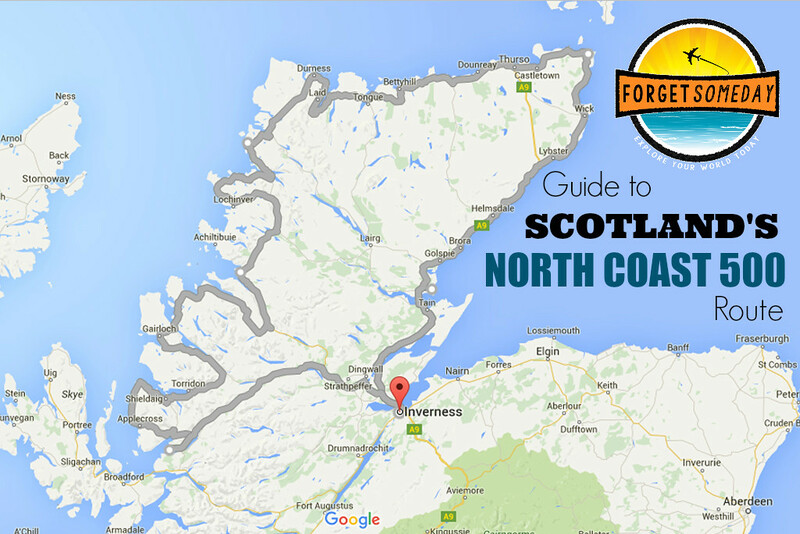 Either way, we hope we’ve provided you with the ultimate North Coast 500 Guide! Before we close out this ridiculously long post, we want to give you a few more tips for making the most of your journey along the North Coast 500! Plan Ahead! 500 miles is a lot of ground to cover, and with so much to see and do, it’s good to have an idea of what YOU want to experience. You could spend a few weeks traveling the North Coast 500 and not see everything. Know how many days you plan to be on the route and plan activities that are of interest to you. Utilize this guide along with the official North Coast 500 website and VisitScotland.com to plan all of the details. Visit Scotland also has several information centers along the route, providing free planning resources and offering great local advice. Take Your Time! Some of the roads are not in the best condition or are otherwise somewhat petrifying on their own. Particularly if this is your first time driving on the left side of the road, be prepared for narrow, one-way, and winding roads in parts! Know how passing places work and take your time. With so much to see along the way, there’s no need to rush. We found that there was nothing to worry about, as most drivers were very courteous and allowed us to pass if we could not pull off the road first. Be Prepared for Quick Changes in Weather! As mentioned before, we recommend you dress in layers that you can put on and take off, as the weather can change by the minute. Weatherproof jackets and shoes are highly recommended for this region. Check Opening Dates and Hours! On a few occasions, we missed out on being able to visit some attractions along the way, because it was either too early or late in the day, or it wasn’t yet open for the season. We also didn’t know that you’d only be able to spot the dolphins off Chanonry Point during high tide, so we missed out on that opportunity as well! So, learn from us and really plan ahead if there are things you definitely want to see or do along the route! Disconnect! We live in an age where many of us are constantly connected to our devices, and even though you’ll want to upload amazing photos from your journey to Facebook and Instagram, it’s important to note that cell towers and WiFi are very scarce along this route. If you absolutely need to connect, your best bet is to stop into a coffeeshop or café, make a purchase, and connect to their WiFi. The Visit Scotland information centers located along the route not only offer free planning resources and offer great advice, they also provide visitors with free WiFi. Though in order to avoid frustration by spending most of your trip searching for a signal, disconnect and simply enjoy the journey! Bring Your Sense of Adventure! Though we urge you to use maps and other resources to plan out your trip, we’d also like to encourage you to feel free to detour off the planned route a little bit to discover lesser known gems! There were a few times where we saw something that caught our eye that was not labeled on the map. We went off in search of adventure, and felt that we had discovered something new! 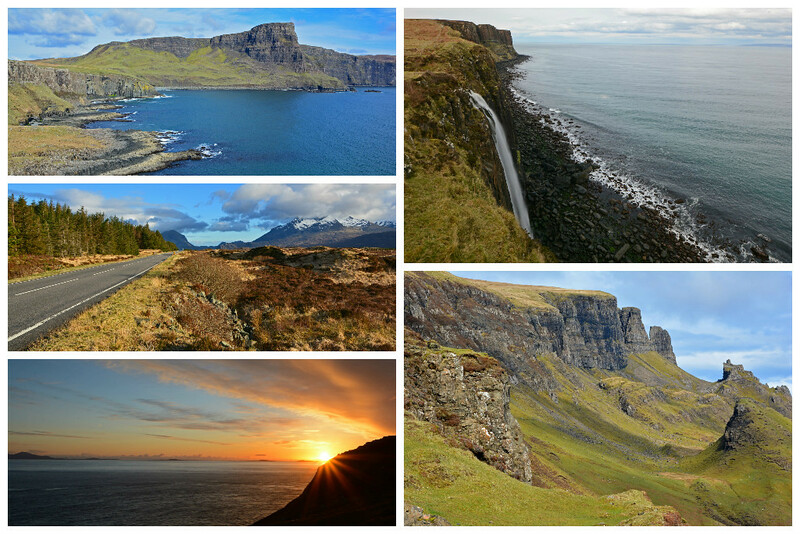 THANKS FOR FOLLOWING OUR NORTH COAST 500 ITINERARY! For further inspiration, please check out the video we put together or our journey along the North Coast 500! 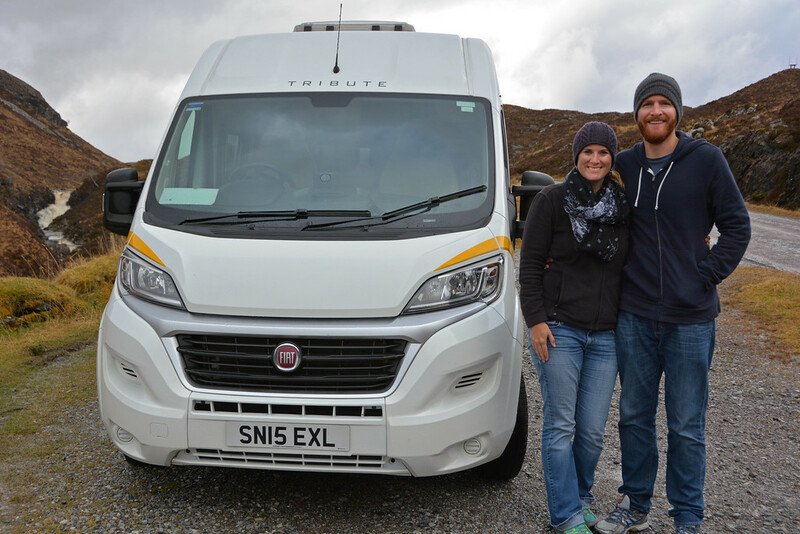 If you’re interested in campervan / motorhome rental for the North Coast 500, Bunk Campers has pick-up locations in both Edinburgh and Glasgow. The size of our vehicle is the maximum we would recommend for the more harrowing drives to Drumbeg and along Bealach na Ba. For reference, we rented the Aero model. (Anything larger, and you’d probably want to take the bypass roads near Drumbeg and Applecross.) We did a few nights of wild camping in our motorhome during our journey and can definitely recommend this method of travel for this magnificent region of Scotland! We’d like to thank Bunk Campers and Visit Scotland for their support in our journey along the North Coast 500. As always, all opinions are our own and are an accurate representation of the experiences we had. Hi sam and toccara. I have just read your excellent blog on the north coast 500. My wife and i have already made plans to do this fantastic route in september, but your blog has just whet my appetite even more for our trip. Thank you for allowing people to experince your journey, and for passing on your tips etc for things to see do and visit. Wonderful! I’m so glad the route was recommended to us and now we want to recommend it to others! When we were planning, I couldn’t find much in the way of things to do between points on the drive, so I wanted to create something useful that future travelers to the route could use. Feel free to download of our guide to take with you! 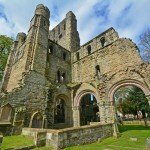 https://forgetsomeday.com/north-coast-500-destination-guide/ Have a blast! It’s a beautiful region of Scotland! Thanks for the added tip! We’ll definitely have to do this drive again in the future, as I know there is so much more to see! Hello- fantastic blog/website and article on Northcoast 500. How long did this take? Could it be done safely and enjoyably in 5 days (no Skye as we will have already done that for 3 days)? Don’t laugh! My daughter and I find ourselves with 6 days to plan June 13-18 after the half marathon on Isle of Skye on 6/11. This has me really excited, just do not know if doable. Thanks for your GREAT accounts of your travels! Thank you so much! We put a lot of time and energy into creating it, so our readers could have a great resource! We did the North Coast 500 in 5 days. Could’ve used another day or two, mostly due to poor weather, but yes it can be done! 🙂 We actually only spent 2 days on Skye and definitely could’ve used more time. Have a wonderful time on your journey along the North Coast 500! We are going to Scotland this summer and are going to follow in your footsteps. It looks like a really beautiful drive. Hope there are not too many white knuckle parts. How wonderful! We love Scotland and between our two separate trips, we’ve spent about 5 weeks there. We still have experiences we haven’t even written about. The North Coast 500 is a beautiful and adventurous drive. There are only a few white knuckle parts, but keep in mind, we were in a fairly large campervan during our journey. Have a wonderful time and let us know if you have any questions about the drive. Thank you so much for sharing. We’re off on the NC500 trip with a campervan (campervanning for the first time and also terrified of the road to Applecross!). This has given me loads to look in to. Stunning pictures too – THANK YOU! You are most welcome! Applecross wasn’t so bad; fortunately, there were not other cars on the road when we made our journey through the pass, so we had the curvy road all to ourselves! Have a wonderful time along the route! Thanks for sharing I am hoping to talk my hubby into this next year. Looks really good. You’re welcome! I hope you’re able to convince your husband to make the drive along the North Coast 500. 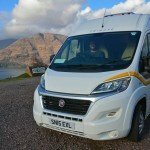 It’s a wonderful road trip and an excellent way to explore the beauty of the Scottish Highlands! Just did a section of the Northcoast 500 – along the west coast to Durness. It was fabulous although the weather was only average. We could not see past the edges of the road on our drive over the Bealach na Ba. The beaches are amazing – windswept with gorgeous white sand. Next time and there will be one, we will spend a couple of weeks and drive the full route. Part of the route is better than none of the route! And I love that you’re already talking about going back for another visit. The weather was less than stellar during our trip, as well, so we’d also love to go back and drive the route again (preferably in better weather). That’s a shame that you couldn’t experience the beauty of Bealach na Ba; hopefully you’ll have better weather during your next trip! Loved your post. We are leaving in a week although we have a home base in Beauly we will be taking day trips along the 500 rt. We are also stopping off in Orkney to visit rellies . Your suggestions were very helpful . Awesome Amber! So glad you found our post useful. Have a great time along taking day trips along the route. at the beginning of October and are renting a small motor home. Unfortunately we only have 5 days, leaving from Edinburgh. We would like to see a distillery on the way and having a hard time now to decide which way would be the most interesting to travel. The clockwise or the counter clockwise. Do you have any suggestion? As we mentioned in our post – “Clockwise or anticlockwise… that is the question! Since the route is set up in a circular manner, you can go one of two ways. While many people choose to drive west from Inverness and complete the route in a clockwise direction, we decided to head north and travel counter-clockwise. There are benefits to both. Traveling clockwise, the coast will be directly to your left, whereas traveling counter-clockwise (or anticlockwise), you’ll have a lane of passing cars on your right between you and the coast. Despite this, we chose to travel counter-clockwise for two main reasons: 1) We didn’t want to encounter the Bealach na Ba pass near Applecross on our first day, as we were driving a semi-large campervan and felt that we needed to get used to the vehicle before tackling this challenging portion of the drive (more on that later), and 2) We wanted to add in a visit to Isle of Skye toward the tail-end of our journey. So, as to not backtrack, we started our journey north from Inverness!” We visited the Glenmorangie Distillery, though there are a few to choose from along the NC500. Have a wonderful trip! !